(Book Jacket Status: Jacketed)For the first time, all the major works of this beloved writer are gathered together in one hardcover volume. Poet, artist, and mystic, Kahlil Gibran was born in 1883 to a poor Christian family in Lebanon and immigrated to the United States as an adolescent. His masterpiece, The Prophet, a book of poetic essays that he began while still a youth in Lebanon, is one of the most cherished books of our time and has sold millions of copies in more than twenty languages since its publication in 1923. 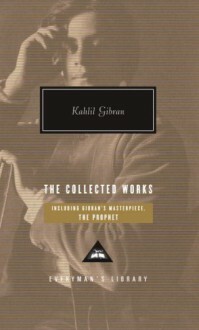 But all of Gibran’s works—essays, stories, parables, and prose poems—are imbued with equally powerful simplicity and wisdom, whether they are addressing marriage or children, friendship or grief, work or pleasure. Perhaps no other twentieth-century writer has touched the hearts and minds of so remarkably varied and widespread a readership. Included in this volume are The Prophet, The Wanderer, Jesus the Son of Man, A Tear and a Smile, Spirits Rebellious, Nymphs of the Valley, Prose Poems, The Garden of the Prophet, The Earth Gods, Sand and Foam, The Forerunner, and The Madman.